A hiatus in global warming ongoing since 2001 is due to a combination of a natural cooling phase, known as multidecadal variability (MDV) and a downturn of the secular warming trend. The exact causes of the latter, unique in the entire observational record going back to 1850, are still to be identified, according to a JRC article which analysed the phenomena. Since 2001, surface temperatures have not risen at the same rate as higher atmospheric radiative forcing. The earth hasn't warmed at the same pace during the 20th century. The noticeable temperature increases during some periods interspersed with fairly stable or decreasing levels during others have been explained as a combination of secular global warming (likely manmade) and natural climate variability. We are currently, in the early 21st century, experiencing a hiatus period, during which surface temperatures have not risen at the same rate as higher atmospheric radiative forcing. JRC scientists analysed surface temperature data records – which began in 1850 – to separate natural variations from secular (i.e., long-term) trends. They identified three hiatus periods (1878-1907, 1945-1969 and 2001 to date), during which global warming slowed down. These hiatus periods coincide with natural cooling phases – the multidecadal variability (MDV), most likely caused by natural oceanic oscillations. The scientists therefore conclude that the MDV is the main cause of these hiatus periods during which global warming decelerated. HadCRUT4 Temperature Anomaly 1850-2013 (°C) (blue and red bars). Secular trend (red line), multidecadal variability (green line) and reconstructed signal from the statistical analysis (black line). Hiatus periods are indicated with grey bars in the x-axis. However, they found that the current hiatus period is, for the first time, particularly strongly influenced by changes in the secular trend, which shows a strong acceleration from 1992-2001 and a deceleration from 2002 to 2013. Such rapid and strong fluctuations in the secular warming rate are unprecedented. This unique fluctuation in the recent secular warming rate could have several causes, such as recent changes in the tropical Pacific Ocean, the accelerated melting of Arctic ice, changes in the deep ocean heat storage or the increasing content of aerosols in the stratosphere. 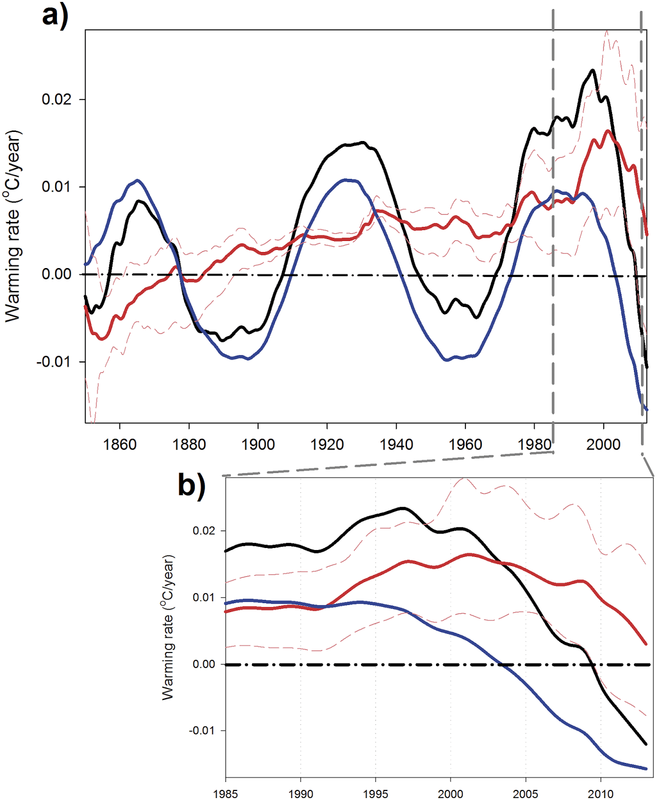 The authors recommend further scientific investigation of the causes and consequences of this change, in order to address whether the global climate sensitivity has recently changed. Such research is crucial to understanding current climate conditions and creating plausible scenarios of future climate evolution. Figure 3. Global warming rate analysis. a) Warming rates (°C year−1) obtained from the different signals identified in the SSA: ST (red line), MDV (blue line) and reconstructed signal (black line). The dashed thin red lines are the confidence intervals for the warming rate associated with the ST obtained from each individual month’s time series. b) Zoom on the last 25 years of the time series. Figure 4. SSA reconstructed signals for Northern Hemisphere surface temperature. 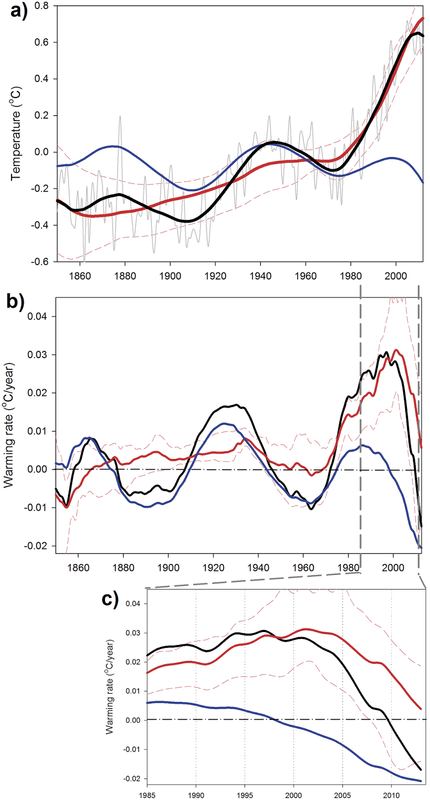 a) HadCRUT4 annual surface temperature (gray line), multidecadal variability (MDV, blue line), secular trend (ST, red line) and reconstructed signal (MDV+ST, black line). The dashed thin red lines indicate the range of variability of the ST obtained by applying SSA to the temperature time series obtained for each individual month. b) Warming rates (°C year−1) obtained from the different signals identified in the SSA for the Northern Hemisphere. The dashed thin red lines are the confidence intervals for the warming rate associated with the ST obtained from each individual month’s time series. c) Zoom on the last 25 years of the warming rate time series. Global surface temperature has been increasing since the beginning of the 20th century but with a highly variable warming rate, and the alternation of rapid warming periods with ‘hiatus’ decades is a constant throughout the series. The superimposition of a secular warming trend with natural multidecadal variability is the most accepted explanation for such a pattern. Since the start of the 21st century, the surface global mean temperature has not risen at the same rate as the top-of-atmosphere radiative energy input or greenhouse gas emissions, provoking scientific and social interest in determining the causes of this apparent discrepancy. Multidecadal natural variability is the most commonly proposed cause for the present hiatus period. Here, we analyze the HadCRUT4 surface temperature database with spectral techniques to separate a multidecadal oscillation (MDV) from a secular trend (ST). Both signals combined account for nearly 88% of the total variability of the temperature series showing the main acceleration/deceleration periods already described elsewhere. Three stalling periods with very little warming could be found within the series, from 1878 to 1907, from 1945 to 1969 and from 2001 to the end of the series, all of them coincided with a cooling phase of the MDV. Henceforth, MDV seems to be the main cause of the different hiatus periods shown by the global surface temperature records. However, and contrary to the two previous events, during the current hiatus period, the ST shows a strong fluctuation on the warming rate, with a large acceleration (0.0085°C year−1 to 0.017°C year−1) during 1992–2001 and a sharp deceleration (0.017°C year−1 to 0.003°C year−1) from 2002 onwards. This is the first time in the observational record that the ST shows such variability, so determining the causes and consequences of this change of behavior needs to be addressed by the scientific community. Click to enlarge. HadCRUT4 Temperature Anomaly 1850-2013 (°C) (blue and red bars). Secular trend (red line), multidecadal variability (green line) and reconstructed signal from the statistical analysis (black line). Hiatus periods are indicated with grey bars in the x-axis. Courtesy: EU. Read the abstract and read the open access paper here. European Commission news release here. Now I'm confused, what is a "secular" trend? Secular - not connected with religion. So the trend is not religious? Hmmm, maybe that's it, temperature trends occur without conformity to the climate change religion.